You take a compound bow shooter, with mediocre recurve shooting ability, with a huge urge to make his own longbow. Only problem is, I have no woodworking skills or experience. This IS my first bow. I have seen my mom's fiance make his first bow, but it didn't turn out, and it was a board bow. So, here we go. 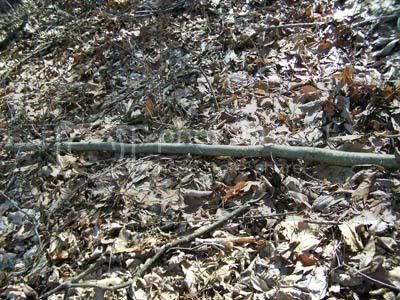 So, I take a walk up the hill, to try and a suitable tree or limb. I figure it needs to be a small tree, because I am not using power tools, and it is much easier to bring down. 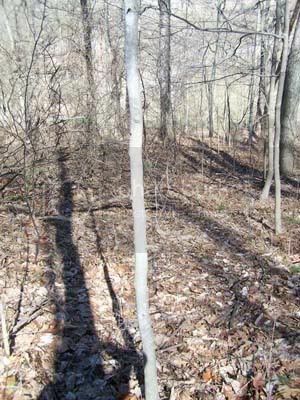 So, I see a skinny little tree, about 9 feet tall, that I figure looks suitable for a bow. Keep in mind I have no skill at all, so I don't know what type of wood it is. I could tell it wasn't hickory, that's about it. So, I take my handsaw, that my girlfriend so graciously bought me for valentines day, and cut it down, and roughly to length. Then I carried it back home, and started on the rest. 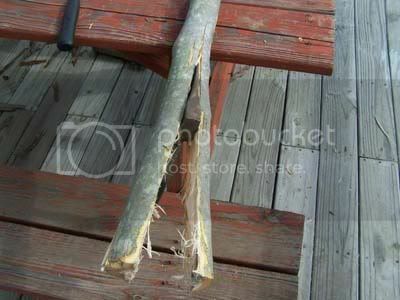 I used a hammer and an old hatchet to split the wood in half. It sounds like an easy job, but you have to make sure that you are splitting it even and straight, and it takes a while, or at least it did for me. I occasionally used a crowbar to help split in places that the hammer couldn't reach the hatchet. After the tedious task of splitting the wood, I am left with two crooked staves. I picked the wider and straigher of the two to continue on with. So, with a draw knife, I slowly peeled of the bark. Once the bark was off, I have a crooked raggy-tag crappy looking stave. I next put it behind my old woodstove in an attempt to rapidly season it. I will start with the tapering in a few weeks. Here is my stave. I will continue when seasoning is done. that always happens to me when i cut a stave and it never seems as good when i get it home. Did you seal the ends? 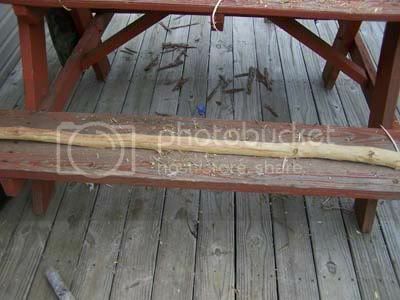 you probbably wouldnt need to if it is 9 ft.
Varik: Be careful with drying this stave too fast. Did you seal the ends and the back? If you didn't It'll probably check and crack all over, especially if you put it in a hot dry place. Best thing I've found is seal everything good and store in my shop for a few months. Then I take em down to roughly a bow and season em a few more months in the house. Central heat/air - dry..
What do you mean by "sealing" the ends? 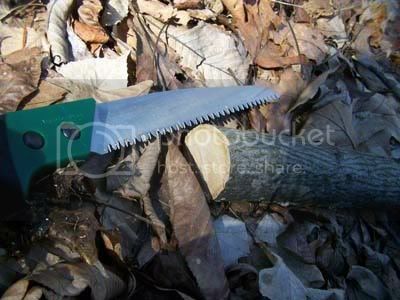 Good question: You have to seal the ends on a green tree you cut down for staves, as soon as the tree is cut it's starts loosing moisture - kinda like you just cut an artery. I generally use some type of white glue (whatever's cheapest) I can't go into detail on why it splits and cracks, but it will. If you take the bark off the back - same deal, your essentially taking away it's natural seal and need to replace it with something else - like glue. I guess the only reason to take the bark off early is to keep bugs from eating your wood and it's easier to debark when it's fresh. Some others will chime in with the scientific explanation why it cracks . but it certaily won'y hurt to seal it. You can use shellac, wheap white(elmers) glue, poly, varnish any of them will work as a sealant. Can't say for sure but that looks like it might be a small maple tree. Good luck and ask questions. Good luck ,looks like you got a good start.The first picture with the saw sitting at the end looks like Hickory but the other looks like Maple.did you cut 2 down ? Nice project. My standard disclamer: there are thoes here much more knowledgable than me. if they tell you something else go with them. just reduce it to general dimentions, full width the whole lenght. AKA dont reduce the front profile on the handle and at the tips. This will reduce the chance for it to warp. You can also clamp it to a board or something strait to help with that too. wait a fiew days and it should be prety close to the right moisture content to work. 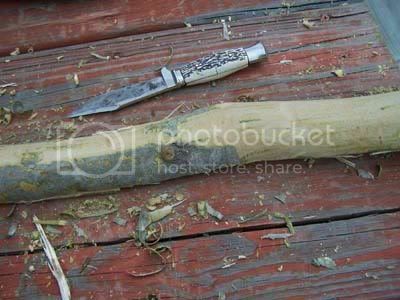 It is also a whole lot easier to work green wood than seasoned wood. especially if your just using hand tools. i did this with a hickory sapling about the same size of yours last summer. had it from living tree to shooting bow in about a week. Tim Baker used this quick drying method to make his stone age bow in the third Traditional Bowyers Bible. stalk softly, and carry a bent stick. That looks like some sound advice Phil , haven't tried any quick cures yet. TBB4? I gotta break down and order that one I reckon . I've never sealed a bow, and have roughed a just cut tree into a bow to dry in the same day. The only checks I've gotten were with some oaks and a locust, and they were just superficial. As Tim Baker says, the thinned piece of wood has very little "inside". This helps deter checks and cracks. You might run across them if you leave it as a full stave, but not so much if you work it down. Oops, I may have put the wrong picture up. I cut a hickory branch down that was just too crooked. That must have been it. I had to cancel that stave, it twisted during seasoning, and is just too brittle to make a bow, if you barely bend it it makes vicious cracking noises.